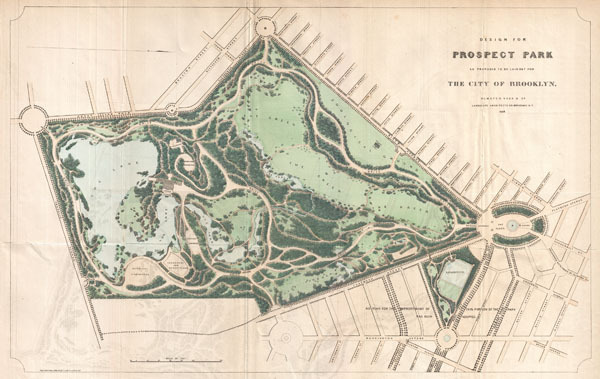 Possibly the first published map of Prospect Park. A rare 1868 first edition of Vaux & Olmstead's map of Prospect Park, Brooklyn. Issued just months after its October 1867 completion, this is one of the first published maps to depict the design of Prospect Park. Depicts the park as a whole and includes pathways, lakes, buildings, individual trees, rocks, and elevation measurements. The streets and avenues surrounding the park are also noted. Bulletin of the New York Public Library, Vol 6, 1901, Page 86 (references both this and the 1870 revision).